When a growing city expects the unexpected, we can respond to confrontations head-on, with confidence. This was the powerful message delivered by Walter Sendzik at the state of the city address on Tuesday, January 30th. In attendance was local business owner and Clickback CEO, Kyle Tkachuk. Clickback purchased the former Police Headquarters at 110 James Street in 2017, which attracted support from Mayor Sendzik. Clickback’s plans of building a Tech Accelerator at 110 James falls into place with Mayor Sendzik’s vision for St. Catharines into the future, with the Mayor’s announcement of Niagara’s first Tech Accelerator (named Accel North). “Kyle bought the building, and I got a phone call from a local businessperson. He said to me, why are you celebrating that a local business bought 110 James? I said why not, why wouldn’t I? He said well, it’s going to increase the vacancy rate. Now we’ve got a local business, we don’t know what they’re going to do there, it’s going to challenge us. Clickback’s CEO, Kyle Tkachuk is a St. Catharines native, and Brock University Alumni. Kyle and his team at Clickback is a local success story that stands out in a competitive industry. But when asked if Kyle expected Clickback to be one of Canada’s fastest growing companies on the PROFIT 500, own our office building or if he expected to be a part of the team to build out the first Tech Accelerator in Niagara, the answer from Kyle Tkachuk is clearly, no. Kyle’s goal has been to employ homegrown talent and not work with overseas teams, which fits nicely into the on-going revitalization of downtown St. Catharines to attract young talent to live and work in the downtown core. A revitalization that Mayor Sendzik is leading the charge on as he asked everyone at the event to join him in signing the Compassionate St. Catharines Charter. In doing so, Sendzik said they’ll be taking action in creating a compassionate city. The charter is also available online to sign at www.compassionatestc.ca. 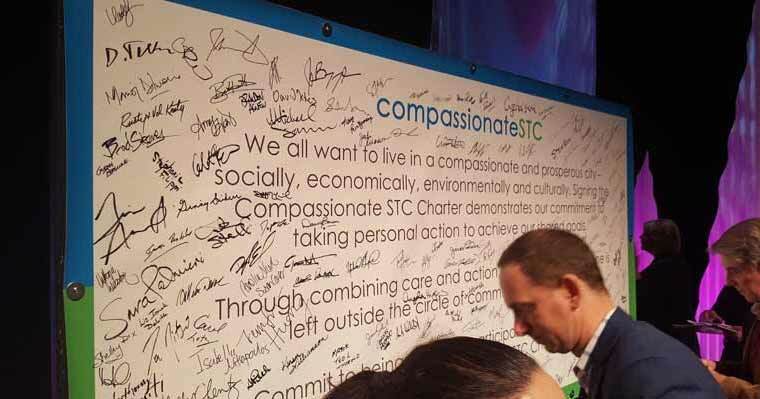 The Compassionate STC Charter at the St. Catharines state of the city address. Audience members lined the aisles to make their way to the stage and sign the charter. This is a clear commitment from Mayor Sendzik to carry out his plans of building a compassionate city here in St. Catharines. 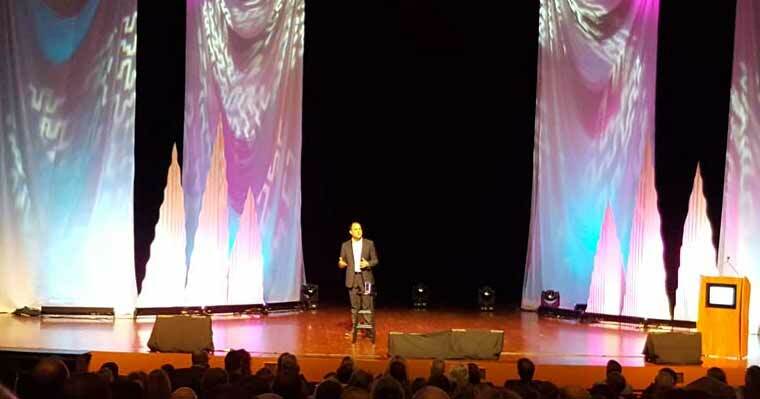 Mayor Walter Sendzik delivers his state of the city address at the FirstOntario Performing Arts Center on Tuesday. Clickback CEO and Accel North principle Kyle Tkachuk, President/CEO of GNCC Mishka Balsom, and Accel North principle Dino Miele, Dave Robitaille of IBM Canada at the 2018 state of the city address. The amazing and well-organized event was put on by Mishka Balsom, President and CEO of the Greater Niagara Chamber of Commerce that was both entertaining and uplifting. “This was a fitting production to be held at the Performance Arts Centre.” – Kyle Tkachuk. The entire team at Clickback truly appreciates your passion and support for Clickback and the development of Accel North, the first Tech Accelerator. When the Mayor believes in your business and expresses his support, it has a lasting effect on the team spirit of all its employees. As the City of St. Catharines evolved, so too did my business model. From the early days of opening an internet solution centre – to evolving into a SaaS B2B lead generation software company – Clickback has embraced change and adapted to unexpected turns along the way. The community involvement and support I received at Brock University and the City of St. Catharines throughout this journey has played a key part in my success. For Clickback to achieve the honor of being named in the Profit 500 for 2017, shows that what we are building is making an impact in our industry. Our SaaS company provides jobs for local professionals in an exciting and growing technology landscape. Trust and support from your community takes time to earn, and can only be achieved with a dedicated Customer First Focus. We appreciate that our passion to create B2B lead generation software solutions has not gone unnoticed. Clickback is very fortunate to have the support of our Mayor and the City of St. Catharines, and for that, we are grateful. We look forward to growing our relationship and support around the Tech Accelerator at 110 James St.
Click here to learn more about Clickback’s history.